Ft. Belvoir, just south of Washington, DC, has been infusing military base planning with a smart growth mentality since before it was cool. 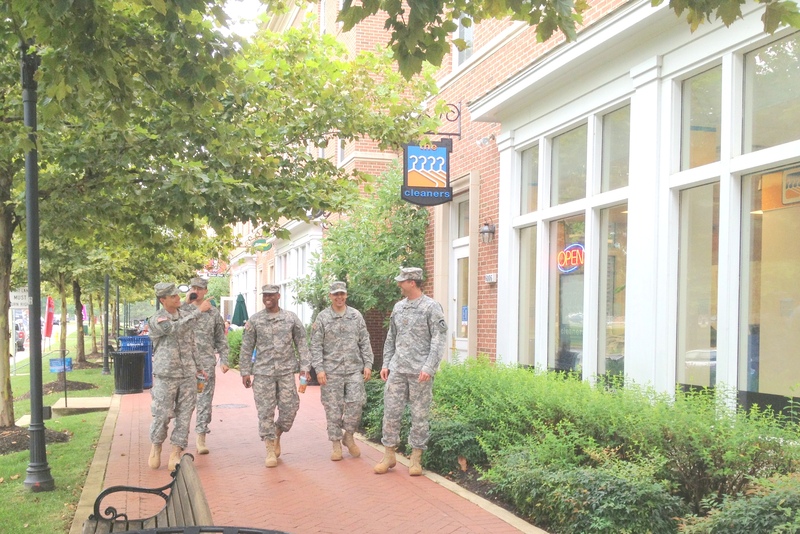 While new guidelines in the past year have compelled all U.S. bases to start building smarter and more efficiently, Ft. Belvoir has been working under a master plan that champions walkability and connectivity since 1993. But two major changes in the last decade forced the base to put all the pieces together and become a true trailblazer in on-base livability. The first of those changes came in 2003, when the base’s housing was privatized, touching off a major rebuilding process. Fortunately, the private company that was brought on to redesign and operate the housing was Torti Gallas and Partners, which prioritized walkability. The second dramatic change came just two years later with the Defense Base Closure and Realignment Commission (BRAC), which ordered the closure of 13 bases and the consolidation of activities. Ft. Belvoir was one of the bases designated to grow the most, and they’re still getting phone calls from newly homeless defense organizations and agencies looking to move in. The daytime population of the base has already doubled, from 22,000 to almost 40,000 employees. The choice of Ft. Belvoir to receive so many jobs was roundly criticized by smart-growth proponents for relocating so many people outside the reach of effective transit — especially since some of those jobs were moved out of Metro-accessible places like Crystal City and Arlington. As a result of the expansion, the Defense Department and Fairfax County are widening Route 1 near the base to a mind-boggling 148 feet. 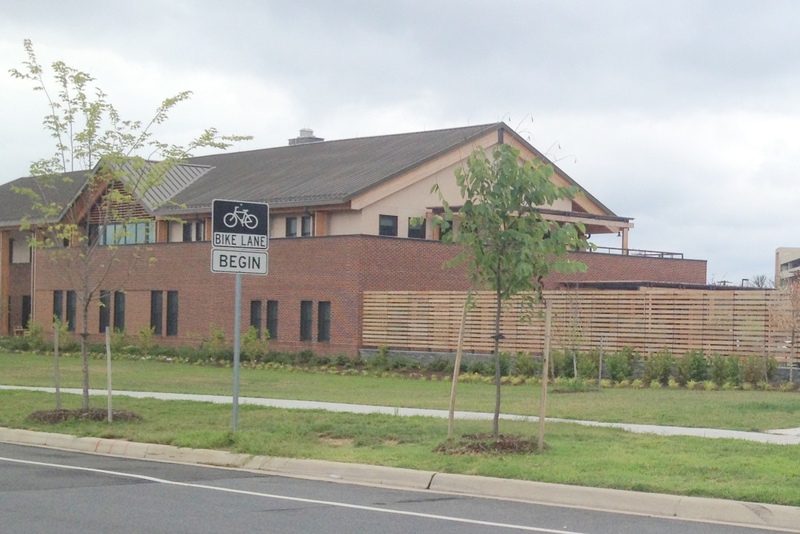 The good news is that Ft. Belvoir’s skilled planners knew how to build efficiently. They built 4 million square feet of new construction in four years to accommodate the new arrivals, taking advantage of the overhaul to make the base more walkable and less auto-dependent. They didn’t also have to have to make the base more beautiful, but they did. 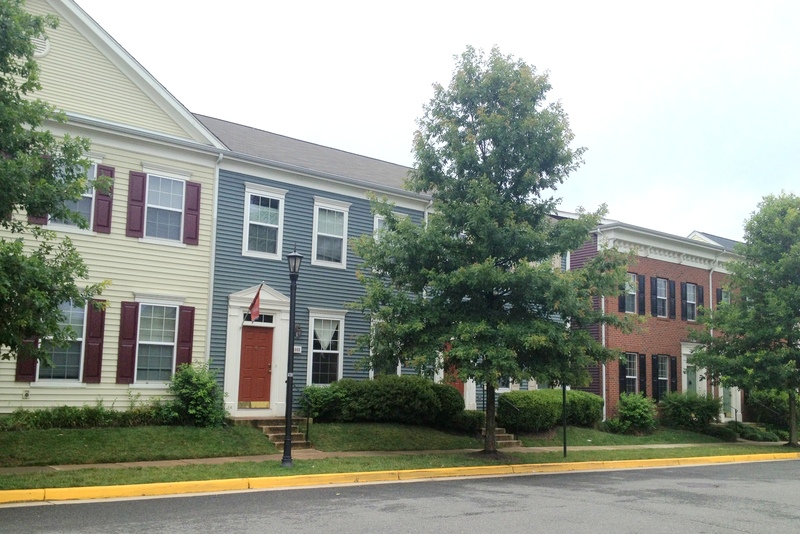 The new housing was built in a style reminiscent of the historic homes of nearby Old Town Alexandria and Colonial Williamsburg, Virginia. The houses are built around courtyards with playgrounds and mail kiosks where neighbors can interact and post notices. Many of the homes are attached townhouses with three or four bedrooms, and some housing sits on top of ground-floor retail. The base’s main commercial strip, 12th Street, combined retail, dining, and residences in the first mixed-use building on a military installation in the past 50 years, according to Robert Goodill of Torti Gallas. Higher-ranking officials (especially those with children) get higher housing allowances and single-family, detached homes. Master planner Chris Landgraf had some unique challenges to deal with in designing a pedestrian-scale community at Ft. Belvoir. “Force protection” rules designed to minimize the damage from potential terrorist attacks essentially mandated sprawl, requiring uses to be spread out. Buildings need to be set back far from the curb — 66 feet back in many cases — as a precaution against car bombers. On the base’s main commercial strip, 12th Street, Landgraf used those mandatory setbacks to build roomy café seating on a wide brick sidewalk, buffered from the street with a grassy expanse dotted with shade trees. He was allowed to build just 33 feet back from the curb in that case, since most of those businesses aren’t occupied by enough people most of the time to trigger the 66-foot requirement (although the line for Subway and Starbucks can get pretty long at peak hours). Even with a line out the door, though, Subway doesn’t make for as attractive a terrorism target as, say, the Defense Logistics Agency building, with 5,000 employees. Across 12th Street from Starbucks and Subway, unfortunately, is nothing. The base has big plans for it though [see image, left]: more than 36,000 square feet of retail, almost 10,000 square feet of dining, 59 residential units… and nearly 500 surface parking spaces. Parking on the base is free, but there is one small disincentive: those anti-terrorism setback requirements. Parking has to be 82 feet from building. The base has turned some of the closest spots into carpool spaces in an attempt to get people to share rides. Landgraf and his team have started to bring in other transportation options. There are now bike lanes running all the way through the base and they’re working with the county to connect their bike lanes to new ones on the soon-to-be-widened Route 1. They’re working on figuring out the $250,000 funding needed to launch a bike-share system for the base. “It’s not in any spending line,” Landgraf said. Though there’s not yet a high rate of bike commuting from off-base, Landgraf said one woman rides her bike 22 miles each way every day, no matter the weather. With that in mind, they’re adding showers as they renovate. And despite the fact that military base planners are constantly insisting that they could never bring transit onto the bases, Ft. Belvoir has done just that — somewhat mitigating the damage from bringing so many jobs outside the Metro coverage area. Buses sync with the Metro and Virginia Railway Express schedules and pass through the security gate without much delay. As for the commonly expressed concern that no one would ride the bus if one existed, that may be true on other bases, but for this one in the DC metro area, people tend to be used to transit and understand its benefits. “It’s been a culture change,” Landgraf said. “We’re starting to get people to understand what their options are, and that they have alternatives to the single-occupancy vehicle.” As more of the new BRAC arrivals are getting to know their co-workers, they’re forming carpools and vanpools to commute more efficiently. Still, 60,000 vehicles go through the Ft. Belvoir gates every day. And while the buses have proven to be more reliable than some expected, the service exists only during rush hours and goes dark between 9:00 and 3:00. Ironically, locating a DMV on the base is a smart-growth move too, and one that Ft. Belvoir is undertaking. The more necessary activities people can do on base, the less they need to drive long distances to do them. And by locating them not just on base but in a smart and efficient way, they can save people a lot of travel, making their cars increasingly unnecessary to conduct the business of their daily lives. That location efficiency takes many forms on the base. When a new, larger hospital and expanded Warriors in Transition facilities were built to accommodate those coming from the shuttered Walter Reed Medical Center, they were built near the gate so people wouldn’t be driving around and around in an emergency. New infill housing was built to be close to community amenities like the daycare, the library, and athletic facilities. They’re trying to bring food trucks near the big employment centers so people don’t need to get in their cars to go to lunch. The old commissary, where people buy food, was just far enough from the exchange, where people buy other goods, that people didn’t want to walk between the two. The new commissary will be built close enough that there’s one common parking lot. Landgraf’s team is also completing the street grid as they make changes, connecting streets that had previously dead-ended. Ft. Belvoir is a “mythbuster,” according to planner Jill Schreifer of the Urban Collaborative, which works with many military installations and helped write the new rules for master planning for the entire Department of Defense. With a good plan and good leadership, the base has proven how enhanced livability measures can make a military installation more useful to the people who live and work on it — especially when their number doubles over the course of a few short years. Now that the new Unified Facilities Criteria for Installation Master Planning is in force, mandating mixed-use, efficient development for all military bases going forward, everyone is trying to catch up. The UFC was challenging enough that even Ft. Belvoir — long a model of exactly the kinds of changes the UFC promoted — has had to go back and make improvements to its master plan to be in compliance. But Ft. Belvoir is facing its own challenges now. Though sequestration has spared the military’s $1.5 trillion-dollar F-35 fantasy from budget cuts, Landgraf hasn’t been so lucky with his own budget. Sequester cuts have meant that he can’t demolish the old hospital — it’s just sitting vacant, right where they want to build new housing to keep up with demand. Schreifer, excited by all that Landgraf has been able to achieve at Ft. Belvoir, asked him if he would speak on other bases that are trying to figure out how to comply with the UFC, but his travel budget has been eliminated. Last month, they didn’t even have a fireworks display on the Fourth of July. It’s too bad you still need a helmet and REFLECTIVE VEST to ride bicycles in uniform on most bases. There’s such a culture of one-upsmanship with regards to fitness in the military, I feel like riding would be incredibly popular if the regs and CO’s weren’t so uptight about PPE and appearances. Great story though, thanks Tanya. Hmm, that’s good to hear Froggie. I’d start pouring over different base regs and comparing them if I was still in right now. Will Cities Hold on to Younger Residents as They Have Children?